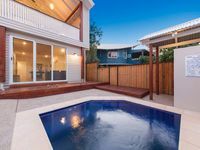 Properties in Mudjimba average 4.6 out of 5 stars. Property 10: 24 Sundew Street, Mudjimba - 500 Bond - Pet Friendly, Linen Supplied, WIFI, Air Cond. 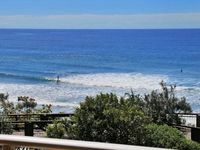 Property 37: Ocean 66 - On the Beach, the perfect sun, surf and sand getaway! Unit 1201 The Sebel Maroochydore - Largest Balcony on The Coast! Property 48: Unit 1201 The Sebel Maroochydore - Largest Balcony on The Coast! The house was wonderful! Great amenities and super comfortable for 8 guests! We enjoyed our 7-day stay in March in the Bondi Units very much. The two-bedroom apartment is spacious and well-equipped. All of the appliances are of high quality and worked well. Everything was very clean. The balcony that extends across the front and part of the side of the apartment gives a wonderful view of the ocean and Coolum Beach. The sound of the surf is a full-time background feature. The beach, stores and restaurants are within easy walking distance. The shower is small but adequate. I appreciated that it included a tub in the base of the shower which came in handy for washing our feet after a long walk on the beach. One thing to note when looking for accommodations in Coolum Beach - even though the climate is semi-tropical, and it was warm and humid throughout our stay, not all apartments have air-conditioning. If you are accustomed to cool and dry inside air and want this in a rental, be sure to check to see that the amenities include air conditioning. I made an assumption when I rented, and I was surprised to discover no A/C. The ceiling fans and the many windows that open for fresh air help, but it is not the same as A/C. Overall, we rate Bondi Coolum as an excellent value.